Planning a smaller meal is key if you plan to have a nomadic-style Thanksgiving in your RV. Prepare as much as you can beforehand. That means cooking your mashed potatoes as you normally would and then freezing or putting in them in the fridge. Be sure to use plenty of butter and cream! If they're a tad bit watery when you reheat them, just add a few dollops of sour cream and you'll be in the clear. Cranberry sauce is another easy item to prepare beforehand, and it'll keep in the refrigerator for a while, so don't feel bad about making a little extra. For salads, do all of the prep in your home kitchen and whip up a dressing. Then, when it's time, mix it all together. And no Thanksgiving is without stuffing, but unless you're planning on making it in the bird, that's also best done at home and reheated. 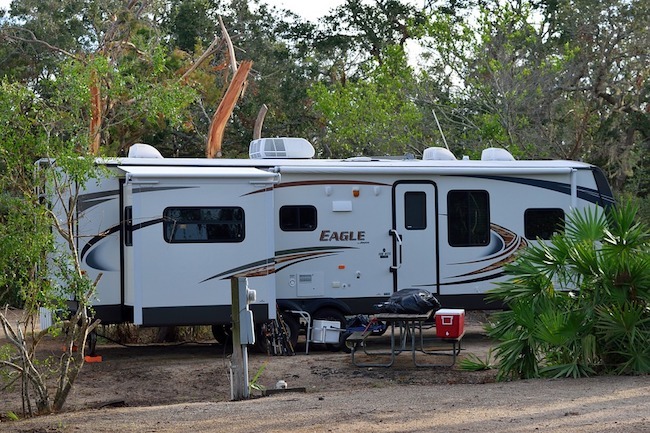 Essentially, your RV's kitchen will only need to handle a small bird, gravy, green bean casserole, and anything else you just can't live without. Deep frying your turkey is another option so that you'll have an open oven for reheating various dishes, but as we all know, deep frying is extremely dangerous. Regardless, you should keep an approved fire extinguisher with you. Another option we came across was the Dutch oven over the campfire or charcoals, and that seems quite a bit safer. You'll just have to keep an eye on the temperature and keep the heat source going for four to five hours. The benefit to the Dutch oven is that it allows you to add liquids as needed, thus reducing the chance of a dry bird and creating a gravy catch. Just remember, when the breast meat reaches 165 degrees and the thigh reached 180 degrees, you're good to feast. What are your thoughts? Have you ever had Thanksgiving on the road? If so, how was it? Let us know in the comments below! Looking for some great make-ahead Thanksgiving recipes? Try these!